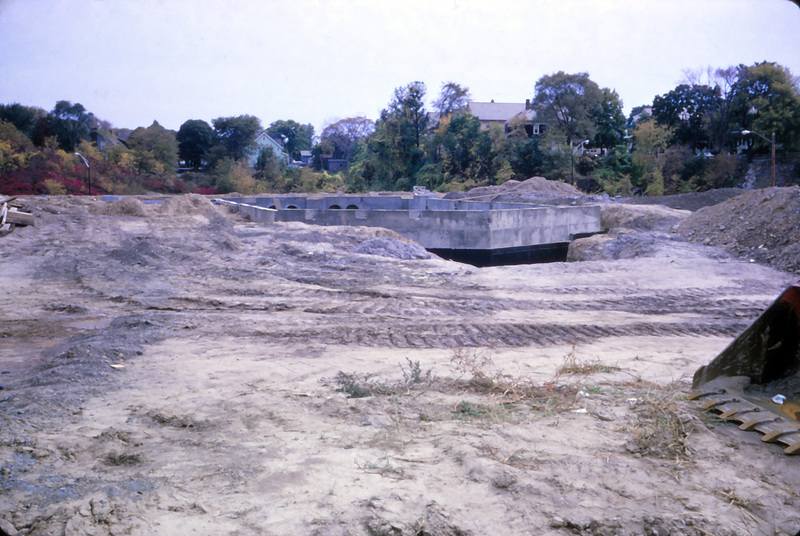 Our first post featured a snapshot of the July 1964 groundbreaking for St. Paul’s new building on Hackett Boulevard. 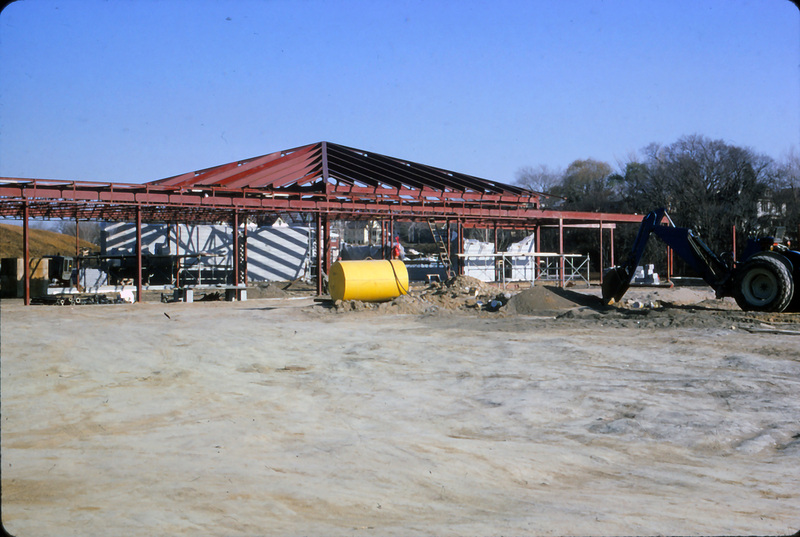 Today, we have a gallery of images showing the progress of construction, from a set of slides in the church archives. 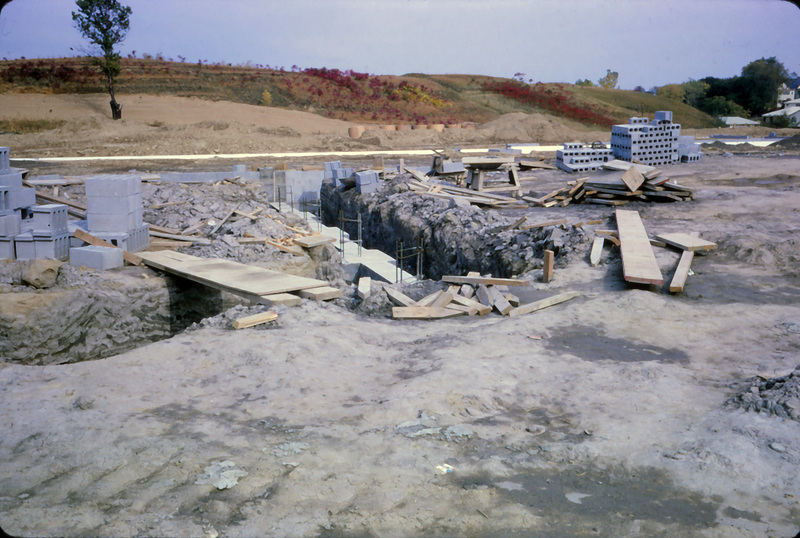 The slides are all labeled November 1964, but they seem to represent several months of early construction. 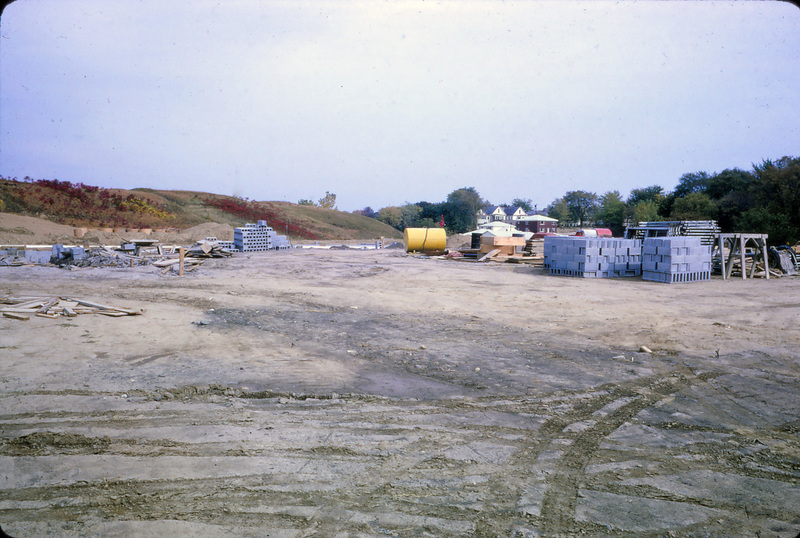 The first three show early clearing and excavation of the site, with much of the original landscape is still visible. The remainder seem to have been taken several months later, with construction well begun. It’s hard to orient oneself, but the roof-line of McEwan Hall is clear. 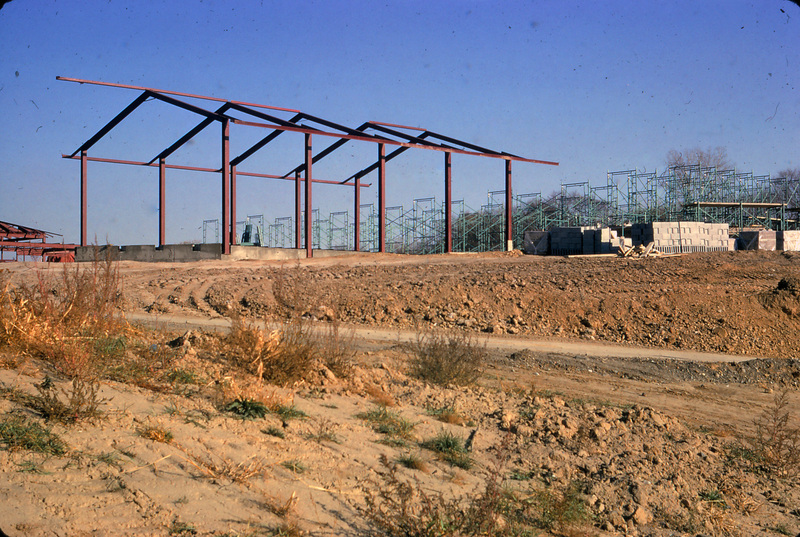 Can the girdered structure be the choir room? This entry was posted in Construction, Hackett Blvd Building on April 29, 2015 by Paul Nance. Of all the articles regularly used in our services, very few are more than a century old. Two silver chalices and a paten dated 1839 are brought out for special occasions. But every time we gather, we see the font, reminding us of the long history of this congregation. 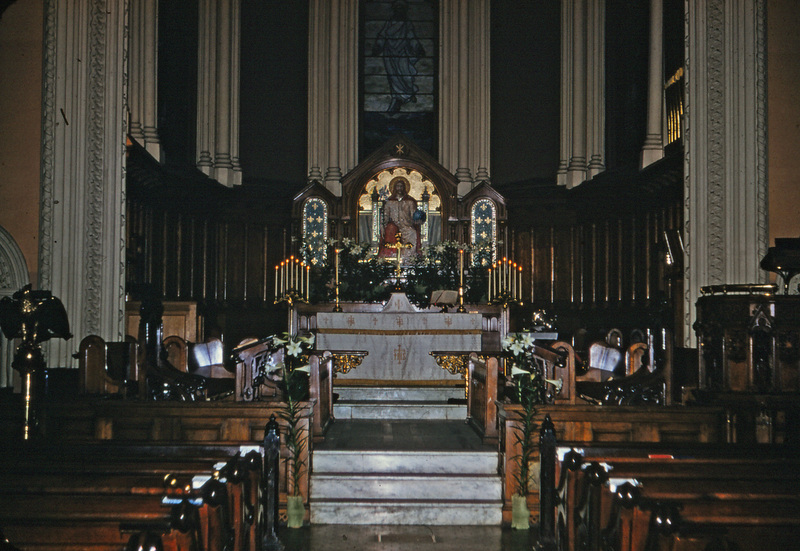 We do not know when we acquired this font, although already in the 1920’s we had had it “for many years.” Here is a snapshot from 1958, showing the font in the Lancaster Street church, in a baptistry of marble and mosaic, below a mural of “Christ Blessing a Child” and next to the marble and mosaic lectern, now placed in the narthex of the Hackett Boulevard building. We do not know who made it. But we do know who arranged for its purchase, and therein lies a story. Albert Gallup, became Albany County sheriff, a position he held until 1835. In 1837, Albert Gallup was elected to the U.S. House of Representatives. The family’s association with St. Paul’s seems to have begun just after Albert Gallup’s single term ended in 1839. 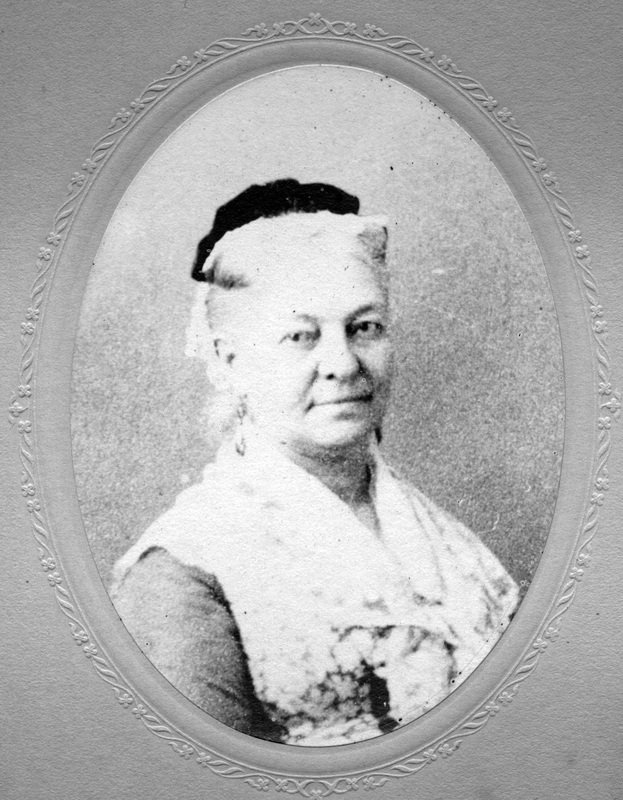 Caroline’s mother, Eunice Smith Gallup, became a communicant of St. Paul’s in 1840, and Albert Gallup began a three-year term as vestryman the same year. Caroline’s early education was in St. Peter’s school, and the school run by the estimable Misses Carter, four “Irish ladies of culture and refinement” who were also St. Paul’s communicants. She then attended the Albany Female Academy, graduating in 1839. Caroline became a communicant of St. Paul’s in 1841. 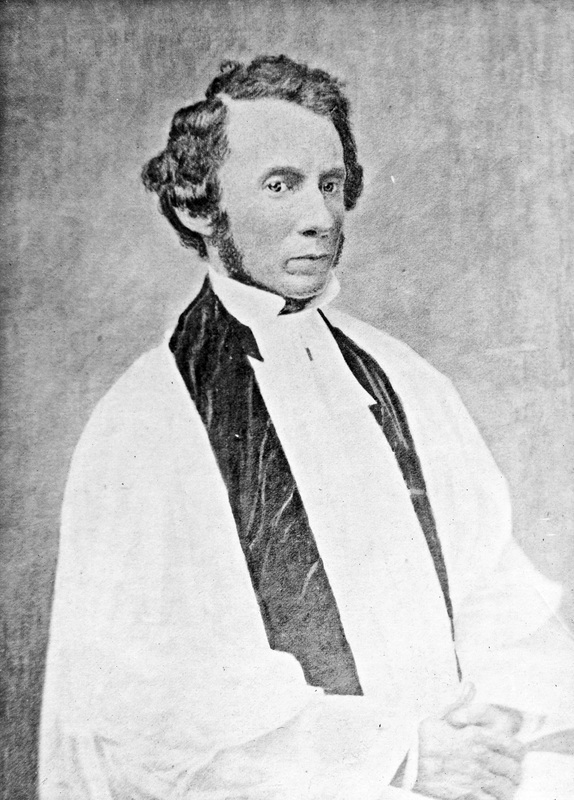 In 1851, Caroline was married at St. Paul’s to Sylvanus Reed in a service conducted by our rector, William Ingraham Kip. Sylvanus had also grown up in this parish. 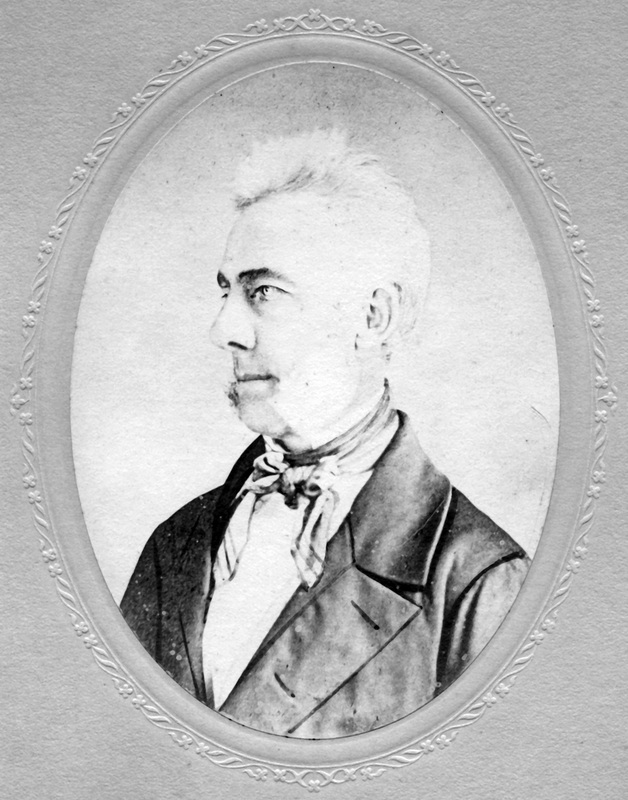 His father was Sylvester Reed, a St. Paul’s vestryman from 1839 until 1839. Sylvanus had the distinction of being the first person from St. Paul’s to enter the ministry. 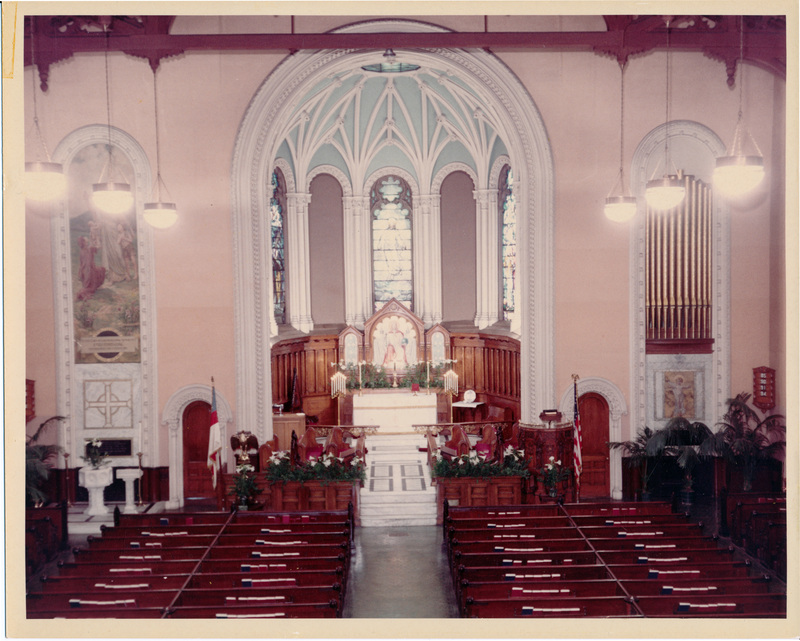 By the time of their marriage, he was rector of the newest Episcopal congregation in Albany, the Church of the Holy Innocents on North Pearl Street. After their marriage, Sylvanus and Caroline lived in Albany for eleven years and all four of their children were born here. Two of these children may be of interest to you. Caroline’s son Sylvanus Albert Reed became an engineer, and designed the first modern metal airplane propeller. Caroline’s daughter Mary Geraldine was a well-known artist; she married Francois Millet, son of the painter Jean-François Millet. In 1862 Sylvanus accepted a position of minister at St. George’s Chapel, and the family moved to New York City. Sylvanus’s health failed soon after the move, and in 1864 Caroline founded Mrs. Sylvanus Reed’s English, French and German Boarding and Day School for Young Ladies. 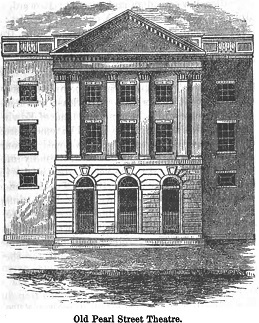 Within a few years, it became on the of most prestigious schools for women in New York City, providing the daughters of the the city’s upper crust with a rigorous college-level education not then generally available to women in this country. The school attracted faculty of the highest caliber, and seems to have been particularly successful in providing employment to women, who found it difficult to find other academic appointments. 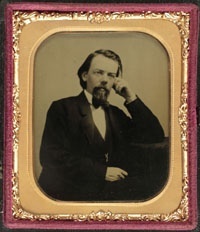 In another St. Paul’s connection, George William Warren, who had been our organist for twelve years between 1848 and 1860 (and likely the organist at Caroline and Sylvanus’s wedding), taught choral singing and solfeggio, and gave private piano lessons at Mrs. Reed’s School. Sylvanus died in 1870, but Carolyn continued as head of the school until 1890, and as a Visitor until 1894. when it became the School of the Sisters of the Church. 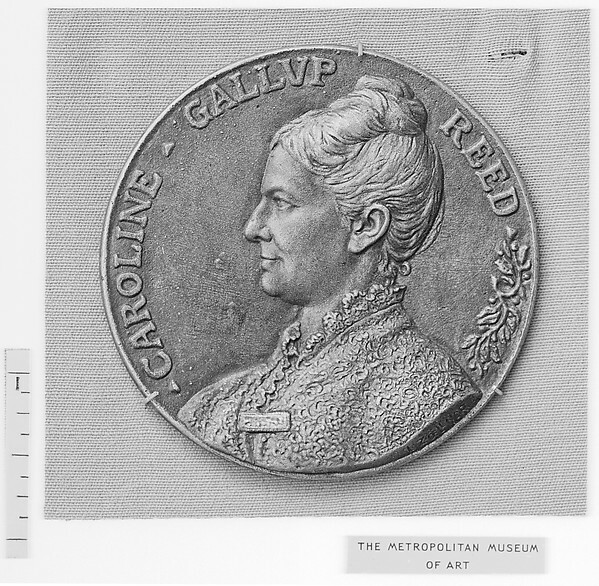 Caroline Gallup Reed died in 1916. 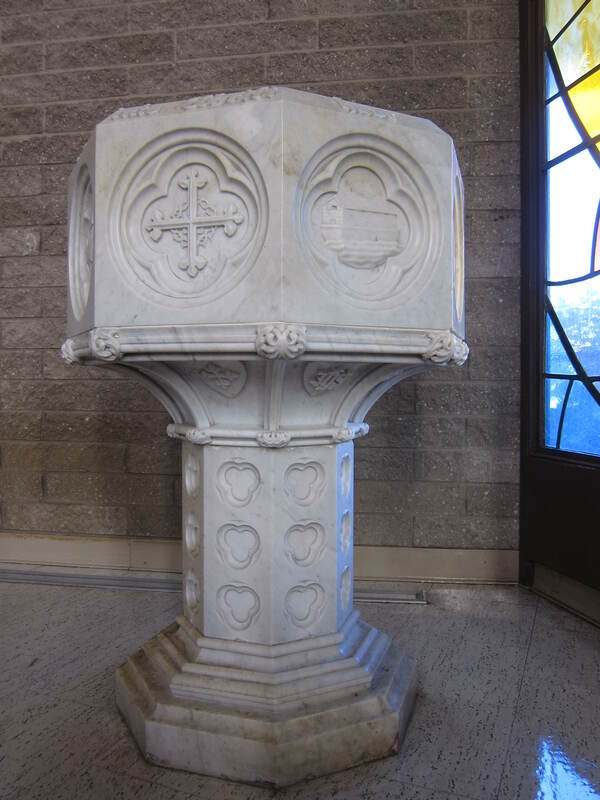 We may never know what efforts Caroline Gallup Reed exerted to bring this font, to St. Paul’s, but its presence in our nave serves as a reminder of our long history, and of our connection to an interesting family with an important role in women’s education. This entry was posted in Clergy, George William Warren, Vestry on April 23, 2015 by Paul Nance. 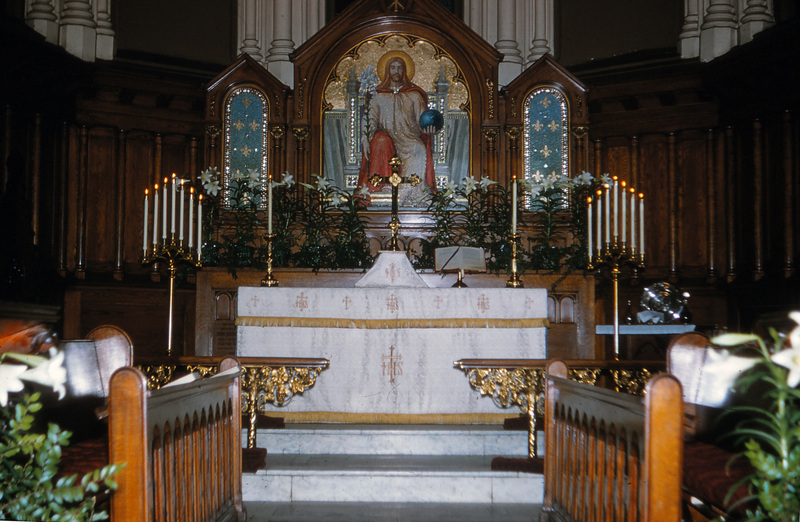 As Easter week comes to a close, I thought you might like to see a few photographs of the church on Lancaster street as it look with the altar decorated for Easter. 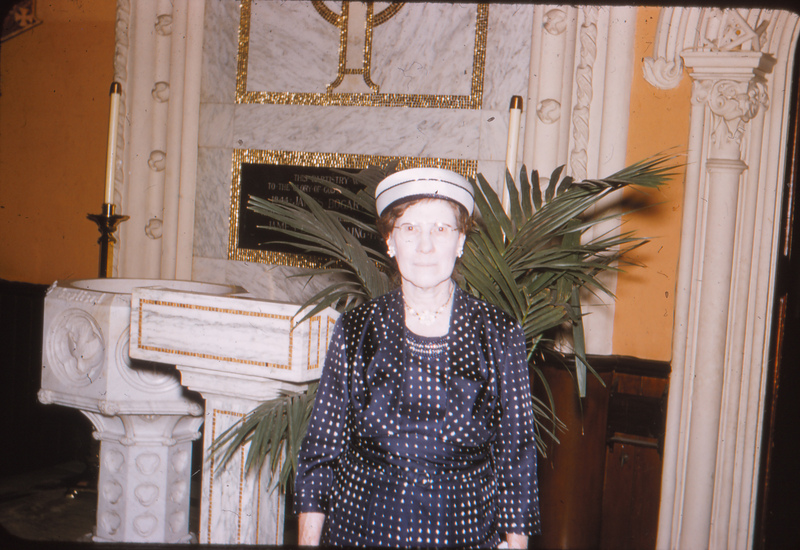 All photos are from color slides found in St. Paul’s archives. The final photo is undated but probably also about 1960. It is unusual in showing a large part of the nave, including the baptistry on the left. This entry was posted in Easter, Hackett Blvd Building on April 11, 2015 by Paul Nance. I take off from our usual topic of St. Paul’s Church today to remember Prof. Dr. Albert Uffenheimer, who died in Albany on this day in 1941. There are many tragedies related to Nazi racism, but this story, of the destruction of one of “the most virtuous of men”, touches us in this city directly. 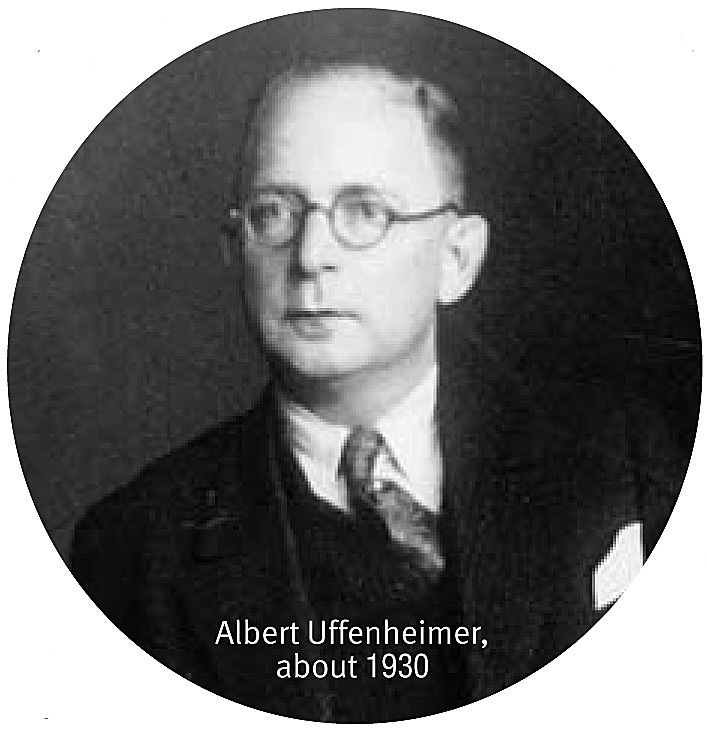 Albert Uffenheimer was born in Fürth, Bavaria, Germany on May 24, 1876, the son of Jewish parents. He completed his medical training at German universities and was awarded a doctorate by the University of Munich in 1899. The early part of Uffenheimer’s career was spent in pediatric hospitals and clinics where he conducted significant research in bacteriology, infectious diseases, immunology, and the physiology of the gastrointestinal tract. After obtaining the Habilitation (a post-doctoral credential required of university professors) at Munich in 1906, Uffenheimer assumed administrative roles in pediatric hospitals and clinics. During World War I, he served as a physician in military hospitals. For the decade after the war, he conducted a private practice in Munich and taught at the university there. In 1925, Dr. Uffenheimer was appointed both Director of the Magdeburg Children’s Clinic and Magdeburg Municipal Pediatrician. As Director, he modernized and reorganized the Clinic and increased its role as a medical training institution. As Municipal Pediatrician, he expanded the agency’s public health efforts, with particular emphasis on reducing infant mortality. 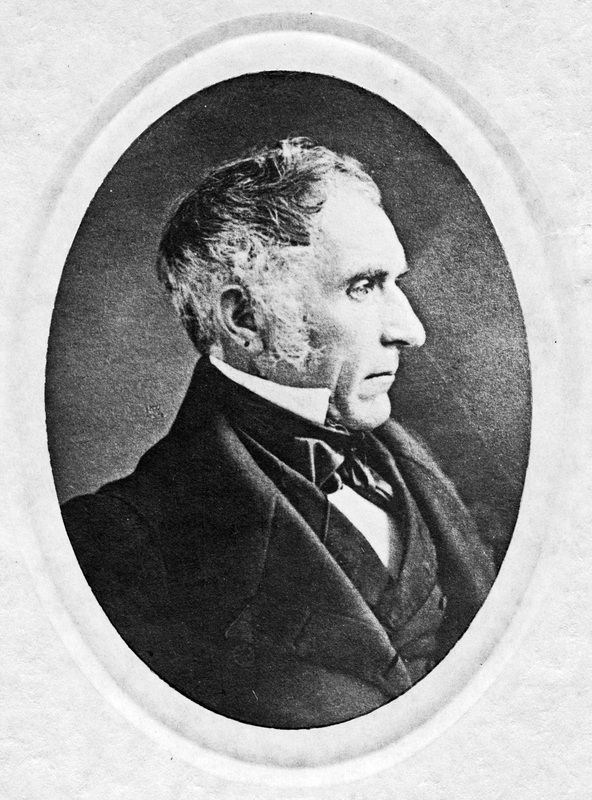 During this period, he continued his medical research and served as co-editor of a pediatrics journal. He developed a particular interest in children with developmental disabilities, for whom he created a special clinic. With the enactment in April 1933 of Nazi laws that denied civil service positions to any person with more than two Jewish grandparents, Uffenheimer was forced to resign his positions. Assisted by the Academic Assistance Council, he obtained a six-month trial appointment at a mental health hospital in England. In 1935, he moved with his family to Kattenhorn, on Lake Constance near the Swiss border. Uffenheimer had become a Catholic in the early 1930s and during the middle part of that decade he studied briefly at the Pontifical Gregorian University in Rome. We assume that it was at this time that he took the saint’s name Maurus as his middle name. In August 1938 Uffenheimer was forced to leave Germany, and he moved to Hertfordshire, England, where he worked with troubled children. This position was also obtained for him by the Academic Assistance Council. His wife was able to follow him to England in December 1938 only after Uffenheimer transferred the contents of two Swiss bank accounts to the German government. In February 1940, Uffenheimer and his wife emigrated to the United States. Later that year he obtained a position teaching psychology at Siena College, which had been founded only three years earlier. The strain of these losses, of poverty, forced moves and the adjustments they required were considerable for a man in his sixty-fifth year: Albert Uffenheimer suffered a stroke in early 1941 and, while recovering, died of a heart attack on April 9, 1941 in Albany. The Siena News, April 25, 1941. Courtesy Siena College Archives. Uffenheimer’s only other memorial is a square in Magdeburg, named in his honor. This entry was posted in General Albany History on April 9, 2015 by Paul Nance. The list of St. Paul’s services for Easter 1883 includes the Children’s Service at 3:30, with a list of hymns they sang. But our archives also includes a copy of the children’s song sheets. Perhaps the most interesting hymn is “The Story of the Resurrection,” to verses by Claudia Frances Ibotsen Hernaman (1838-1898), prolific author of hymns, particularly for children. She is represented in the current Episcopal hymnal by the Lenten hymn “Lord, who throughout these forty days”. You’ll notice that the text is divided into four sections –The Question, The Answer, The Story and Our Cry to Jesus. One English edition (M. Woodward, The Children’s Service Book as Used in the Parish Church of Folkestone. Folkestone: Vaughan & Russell, 1881.) assigns Section I to Two Choristers, Section II to Choir, Section III to Children and Section IV to All, suggesting a ataged performance. The earliest edition for which I can find a melody is from the same year (Charles Lewis Hutchins ed., The Sunday-School Hymnal and Service-Book: Medford, Mass: by the editor, 1881.) It is possible that this was the edition used at St. Paul’s, because it contains versions of five of the six hymns on the song sheet. While the composer is not named, we know that he was English organist and composer Alfred Edward Redhead (1855 — 1937), because he is credited in a later version. 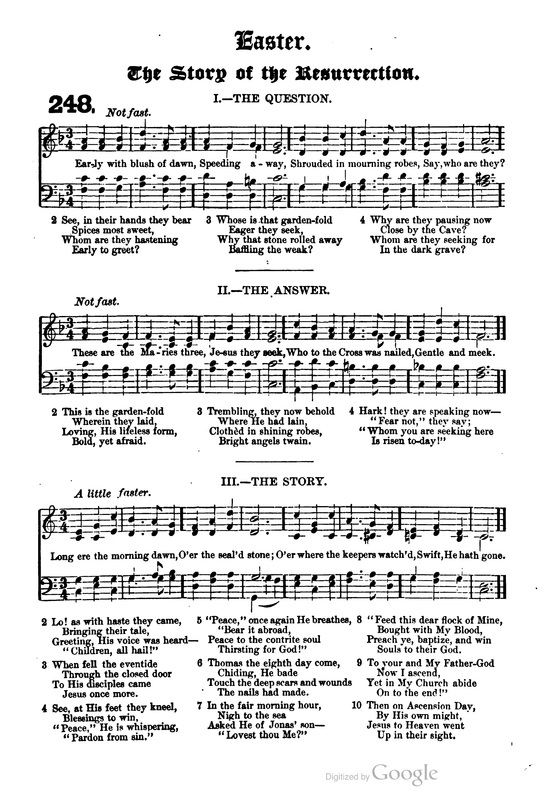 Redhead adds interest and drama to the hymn by using three different melodies. The Question and The Call use related melodies in the same key, both marked “Not fast”; The Story changes the key, and increases the tempo “A little faster”; Our Cry to Jesus returns to the key, melody and tempo as at the beginning. 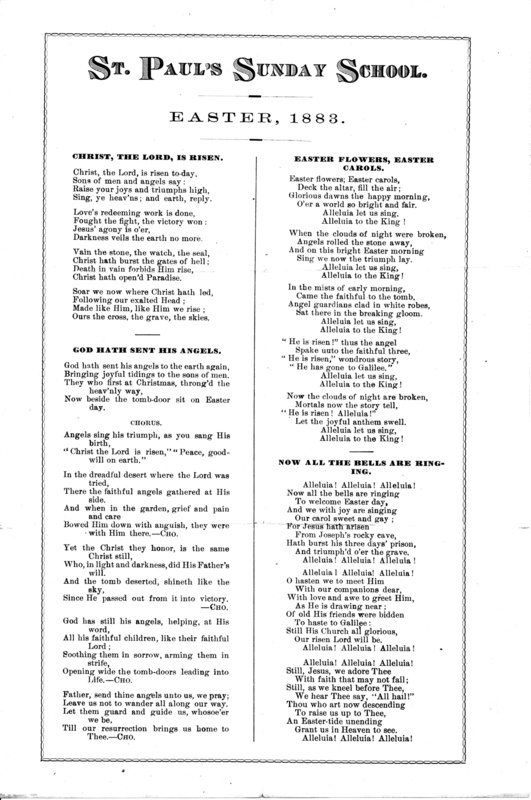 In Redhead’s later version entitled “Resurrection Song” (F. N. Peloubet and Hubert P. Main eds., Select Songs No. 2: for the Singing Service in the Prayer Meeting; Sunday school; Christian Endeavor Meetings. New York: Biglow & Main Co., 1893. ), he uses a different device to add drama, including Sections I and II only, but alternating quatrains from Question and Answer, and suggesting performance “By two Classes, or the School in two Divisions. This entry was posted in Easter, Music, Sunday School on April 8, 2015 by Paul Nance. A hand-written document, found in St. Paul’s archives, with the notation “Dr. Henry Coppeth [sic], University Penn., wrote these verses in St. Paul’s Rectory”. And thou thy Lord bewailing. The God within was stronger. To bless and share they bread. To Father, Son and Spirit. Amen. The notation misspells the author’s name: when this verse was published in 1882, it was ascribed to Henry Coppée, one-time professor at the University of Pennsylvania. Historical Sketch, by Edmund M. Hyde, 1896.. It is not certain when and why Coppée would have visited St. Paul’s rectory. His first visit to this area was in 1866 (to receive an honorary LL.D. at Union College) and, since that was the last year he taught at Pennsylvania, that may be the year of composition. On the other hand, Coppée was in Schenectady and Albany many times between 1866 and 1880, so the date may have been later. 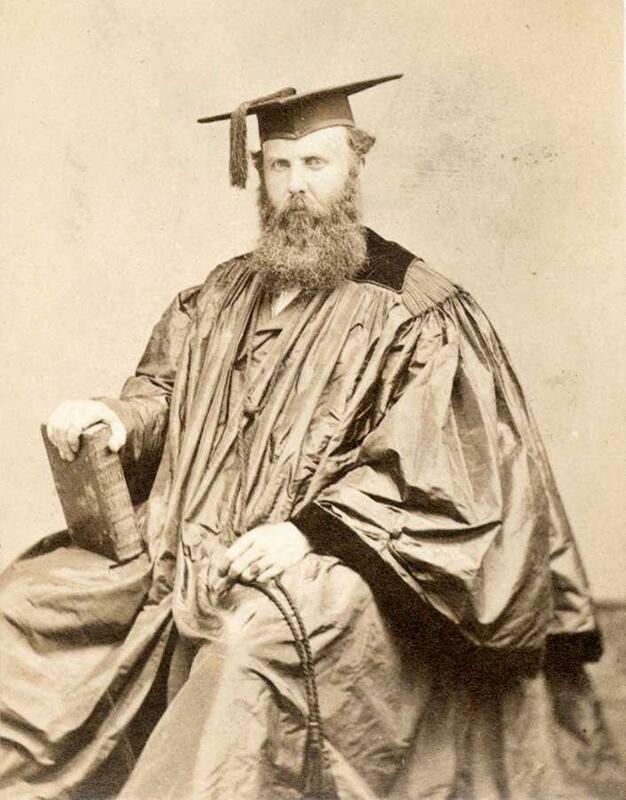 As to the connection to St. Paul’s, our rector from 1864 until 1891 was J. Livingston Reese, a long-time member of Union College’s Board of Trustees. 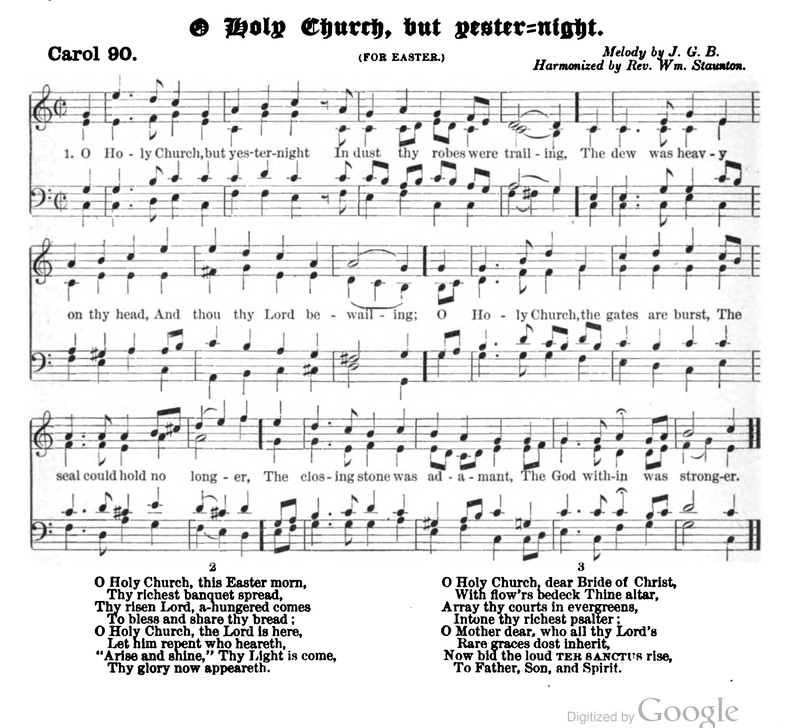 “O Holy Church” was first published in The American Church Review for April 1882, with a few small changes. The text itself only gives the initials “H.C” and “Bethlem, Penn.”, the location of Lehigh University, where he was professor. 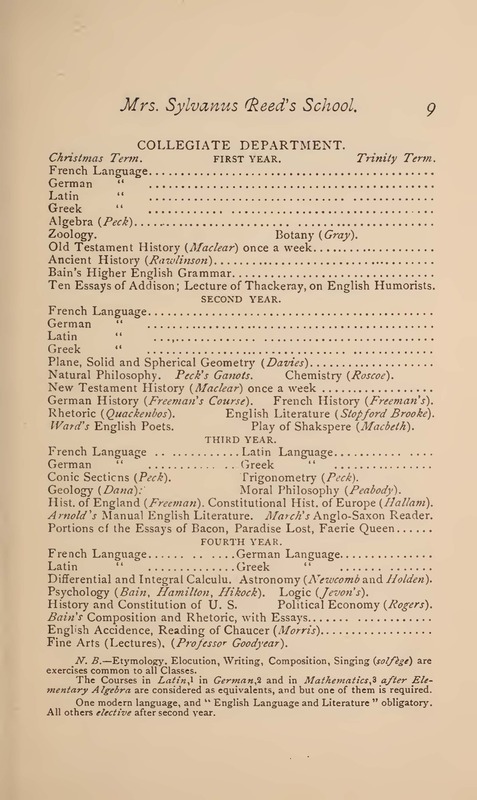 The magazine index, however, lists Coppée ‘s full name. 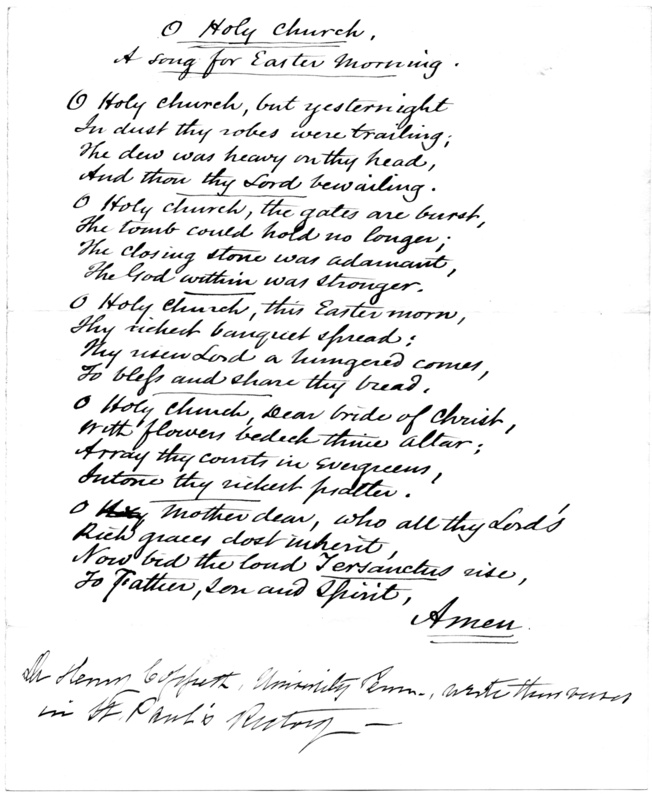 Five years later, in volume 4 of The Parish Choir, the poem was used as the text for an Easter Hymn. In this publication, Coppée is not credited, and an additional quatrain was added to fit the melody. This entry was posted in Easter, Music on April 5, 2015 by Paul Nance. Holy Week 1883: What was St. Paul’s Choir Rehearsing? We are now half-way through Holy Week, and St. Paul’s choir met last night for our Easter Sunday dress rehearsal. I thought it might be interesting to take a peak at what Easter repertoire the choir would have been rehearsing more than one hundred years ago. From the church archives, here is the card showing the Order of Easter Services for March 25, 1883. The processional “Ye Choirs of New Jerusalem” is by George William Warren, born in Albany and organist/choirmaster at St. Paul’s (with a few breaks) from 1848 until 1860. The Te Deum and one hymn are by Dudley Buck (1839 — 1909), a prolific and very popular American composer. The Jubilate was by Wolfgang Josef Emmerig (1772-1839). The Ascription is the chorus “All Glory to the Lamb that died” from the oratorio “Last Judgment” by German composer Louis Spohr (1784 — 1859). The Offertory is the Gloria from an unnamed Mozart mass. 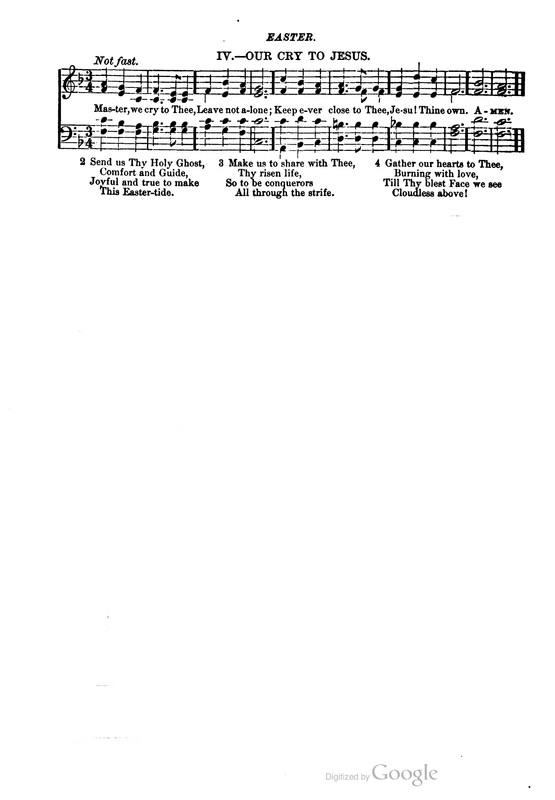 The Evening Service anthem “Hosanna to the Son of David” is probably by the English composer and musicologist Sir George Alexander Macfarren (1813 — 1887). We do not know the identify of the paid soloists in the quartet choir, or the names of the members of the larger amateur chorus that would have performed this music. It is certain, however, that the organist/choirmaster was Thomas Spencer Lloyd, who had served in the role at St. Paul’s since 1865. Unfortunately, this was Lloyd’s last Easter. A week later he fell ill, and he died on April 10, 1883, his 53rd birthday. This entry was posted in Choir, Music on April 2, 2015 by Paul Nance.